The recent beheadings of three Westerners, Foley, Sotloff and Haines, at the hands of the Islamic State (ISIS) has sparked a wave of indignation and strong condemnation by Western heads of state. For anyone aware of what has been truly going on in Syria from the outset of the war in March 2011, there is something unusual in these strong statements, which are now the object of a wave of “humanitarian bombings” under a counter-terrorism mandate directed against the Islamic State. Lest we forget, from the outset of the war on Syria in March 2011, the US and its allies supported so-called “Freedom fighters” largely composed of the Al Nusrah and ISIS brigades. Trained in Saudi Arabia and Qatar, these pro-democracy terrorists were routinely involved in atrocities including beheadings directed against Syrian civilians. Double standards? In the course of the last three years, no Western leader made any statements in regards to these atrocities committed by “Muslim extremists”. They passed virtually unnoticed. No concern was expressed by the international community in this regard. With some exceptions, these beheadings were barely the object of media coverage. Is it because the “freedom fighters” integrated by ISIS and Al Nusrah forces were beheading Syrian civilians rather than Westerners. Was it because the victims of these atrocities were opposed to the bloody “pro-democracy revolution” sponsored by US-NATO against the government of Bashar Al Assad? Why are Western leaders only appalled now? Is it because now Westerners rather than Syrians are being decapitated? These recent beheadings of American and British nationals, whether authentic or not, are obviously exploited to pave the way for a military intervention in Syria. This is a basic propaganda technique used time and time again to gather support for war and the mainstream media is there to convey this propaganda. The mainstream media’s role is not to inform people but to appeal to their emotions and manipulate them into approving what they would otherwise refuse. Westerners don’t want to go to war in the Middle East again? Show them one of their fellow countrymen getting his head cut off by a “Muslim” and they will change their mind. And you don’t even need to show anything, just say that people in high office have seen the horrific act and have their media mouthpieces repeat what they have said. It works every time. If this technique is used rather than valid arguments, it’s in part because it always works like a charm and this is what the mainstream media is for, but also because the “valid arguments” which could be used to intervene could only be lies and easily refuted, as this article will attempt to demonstrate. Several independent media have questioned the authenticity of the beheading videos and some experts have clearly qualified them as “fake”, at least in the cases involving journalists Foley and Sotloff. The true identity of both men has also been questioned, especially Sotloff’s, who has known ties to the Israeli secret service (Mossad), and has been allegedly photographed behind a machine gun belonging to the Syrian rebel fighters. As “Operation Mocking Bird” has documented, journalism is the best cover for an intelligence operative. Several former CIA officers have confirmed that it is used to plant stories that are picked up by news outlets as facts when they actually are propaganda pieces (see CIA Manipulation: The Painful Truths Told by Phil Agee and John Stockwell about false reports generated by the CIA). The DC based “producer” of the terror videos, SITE, with its close links to the Pentagon and the FBI, is also suspicious and tends to point to a major propaganda stunt originating in the US. For the purpose of this article we will however examine the situation and the reaction of Western leaders from the point of view that these beheadings actually took place and that the videos are authentic. Atrocities committed in Syria were reported from the outset of the unrest in 2011 by independent media. It took some time for the mainstream media to mention those atrocities, but since 2012, many reports have been published by the mainstream press, in spite of which the prevailing discourse on Syria remained essentially the same: the “tyrannical Assad regime” was brutally repressing a “pro-democracy rebellion” and the West was still expressing its unyielding support for the “pro-democracy fighters”. The only difference was that at some point the U.S. authorities had to admit the presence of terrorist groups among the “moderate rebels” even though these so-called moderate rebels were never clearly identified. Even former CIA operative Bob Baer said in a CNN interview following Sotloff’s alleged beheading that “there are no moderate rebels in Syria”. Here are only a few excerpts of various mainstream and independent articles and videos mentioning beheadings by rebels in Syria in 2012 and 2013, including reports from the UN and Human Rights Watch, which are usually used to support “humanitarian interventions” abroad. Christian Andrei Arbashe, 38, was kidnapped and beheaded by rebel fighters in northern town of Ras Al-Ayn on the Turkish border. News came as pro-government forces celebrated their victory against rebels near Aleppo Airport. The term “rogue elements” is used to create distance from and excuse the FSA, but the frequency of beheadings and other atrocities committed by rebel fighters prove the contrary. Extensive and horrifying footage of an incident in which two men are executed by beheading in which a child participates now comes from two different sources. Footage posted to YouTube by Voice of America Arabic (Radio Sawa) anchor and journalist Zaid Benjamin, shows a child hacking a prisoner’s neck with a machete. In fact, different footage of the same incident was previously shown on 26 November on Sama TV (A Syrian channel) as part of a segment which demonstrated the difference between Turkish propaganda on the Syrian conflict and the actual reality. Even the very conservative Economist reported in October 2013 about an “assault by rebels, led by al-Qaeda affiliates” against Alawites considered to be “heretics” by the jihadists. This was day one of an assault by rebels, led by al-Qaeda affiliates, on Syria’s northwestern coastal region. Early in the morning bands of opposition fighters overran a government checkpoint and pushed into an area of ten villages, carrying out killings that Human Rights Watch, a New York-based pressure group, says may amount to crimes against humanity. Local residents reported indiscriminate gunfire and murder. 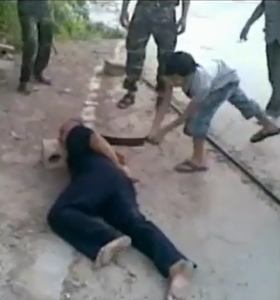 Should we conclude that “normal behavior” for the Western-backed FSA and ISIS includes beheading people? The Human Rights Watch report from October 2013 explicitly states that the murders committed in “Operation to Save the Coast” in the Syrian region of Latakia were committed by 20 groups including ISIS, Jabhat al-Nusra AND the FSA. It also clearly indicates that individuals from Saudi Arabia and Qatar, know to be Western allies, funded and planned the “Operation to Save the Coast” and that the foreign fighters entering Latakia at the time almost did so entirely from Turkey, a NATO member. So if we summarize, over 200 civilians were killed in this single operation, most of them were decapitated, most probably by Western-backed foreign fighters transiting through a NATO member state. Where was the disgust, the horror and the outrage from Western leaders back then? It is quite obvious that the decapitations of hundreds of Syrian civilians by Western-backed forces would completely destroy the propaganda and prove that Assad was telling the truth when he said he was fighting a foreign terrorist invasion. That’s why this report was not much talked about and the narrative stayed the same in the Western media. The recent ISIS beheadings are just another pretext to intervene militarily in Syria. The hundreds of decapitations of Syrian nationals which have been committed by the Western proxy soldiers for years prove that this is just another PSYOP to gather support for another war in the Middle East. Below you will find longer excerpts of the Human Rights Watch report mentioned above. In 2006, the name of al-Qaeda in Iraq was changed to the Islamic State of Iraq. This group is now operating in Syria under the name the Islamic State of Iraq and Sham (ISIS). Abu Bakr al-Baghdadi is the group’s leader and he has sworn loyalty to the al-Qaeda leader, Ayman al-Zawahiri. According to the opposition activist who spoke to Human Rights Watch, Abu Ayman commanded the group during the August Latakia offensive.Abu Jaafar from ISIS has also been identified as the first deputy commander of the operation. Multiple opposition sources identify ISIS as one of the leading groups involved in the “Operation to Liberate the Coast.”Videos posted by opposition groups on YouTube also show ISIS’s involvement in the offensive on August 4.On August 6 the opposition activist that spoke to Human Rights Watch also said that the ISIS played a key role in abducting and holding civilian hostages from the villages. According to an opposition military leader from Latakia working on the hostage exchange, as of early September ISIS was holding 110 to 120 hostages. I am here [in Latakia countryside] today to get a picture on the true achievements and the big successes that our fellow revolutionaries have achieved in the coastal campaign and to respond to the charges that claim incorrectly that we will end our operations here on the coastal frontlines. We are here today to assure everyone that our chief of staff is cooperating fully with the coastal military front command regarding their military activities. We are not going to withdraw as was falsely claimed but on the contrary, we are cooperating to a great extent in this operation. … [T]he participation of Idriss and fighters under his command in the “Operation to Liberate the Coast” appears clear …. According to a humanitarian worker in Turkey, based on his observations, foreign fighters entering Latakia governorate do so almost entirely from Turkey, even flying into Hatay airport where they are picked up by other foreign fighters and facilitators.